Aadhaar is a 12 digit unique identification number that every Resident of India (regardless of citizenship) is entitled to get after furnishing his/her demographic and bio-metric information. 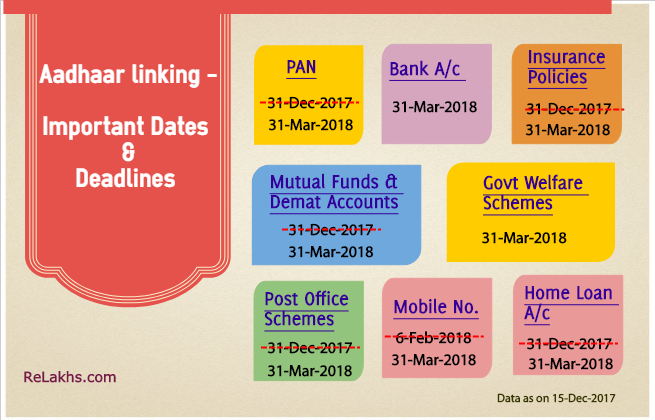 There are certain important dates and deadlines that you need to meet related to your Aadhaar, in order to avoid pain in the coming calendar year, 2018. Latest News (26-Sep-2018) : After the Supreme Court’s latest verdict, where all Aadhaar is needed or not needed now? – my latest article. The above deadline is only for those filing income tax returns this Financial Year (2017-18). If you are not required to file your ITR as per tax laws, i.e., your gross total income in a financial year is less than the exemption limit of Rs 2.5 lakh (for the FY 2017-18), then the last date to link your PAN with your Aadhaar is yet to be notified by the government. As per the new rules, one has to mandatorily submit his/her Aadhaar and PAN details to be KYC-compliant. The Govt has recently clarified that this deadline has been extended till 31st March, 2018 for existing bank account holders. 31st March, 2018 or six months from the date of commencement of account based relationship by the client customer. But as far as opening new bank accounts are concerned, Aadhaar or Enrollment ID must be provided as proof of identity while opening the account(s). You need to get your Aadhaar & PAN details updated for the all investments you have made like – Mutual Funds, Insurance policies, NPS, Post office schemes (like PPF, NSC, Sukanya Samriddhi, KVP etc.,), Atal Pension Yojana, Varishtha Pension Bima Yojana, Demat Account etc., by 31st December, 2017 31st March, 2018 or six months from the date of commencement of account based relationship by the client customer. .
You also need to submit your Aadhaar & PAN to your home loan provider (Bank / NBFC). If you fail to be kyc compliant then your accounts will be blocked and become in-operational. EPF UAN : The EPFO has made it mandatory for all its pensioners and subscribers to submit Aadhaar numbers. The deadline was September 30, 2017. Aadhaar is a must for Online EPF Claim submission and Claim settlement. Govt Welfare & Social Security Schemes : Recently, government in the Supreme Court has said that it has extended the deadline for mandatorily providing Aadhaar details in order to avail subsidies and benefits of social schemes. The new extended deadline is now March 31, 2018. Mobile SIMs : As of now, the deadline to link your mobile number to Aadhaar is 6th February, 2018 31st March, 2018. Death Certificate : The Government has made Aadhaar card mandatory for the registration of death from October 1, 2017. The government also plans to make linking of Aadhaar mandatory for driving licence. Latest News (13-Mar-2018) : The Supreme Court has extended the March 31 deadline for Aadhaar linkages (except for Govt Subsidies & Welfare schemes) till the constitution bench delivers judgement on the matter. How to check / verify if your Aadhaar number is active? How to check your PAN card validity status online? The above dates and deadlines are as on 01-Dec-2017. In case, these deadlines get extended, will update this post accordingly. What is the Latest update regarding Deadline of link aadhar to bank account. Dear Pundlik ..As of now, the deadline has been extended indefinitely until the Supreme court delivers its judgement.. I WISH TO DO 250k LUMPSUM FOR SHORTERM (2 YEARS) PLAN CAN YOU PLEASE ADVISE SOME LOW RISK INVESTMENT WITH AVERAGE RETURN. If you have updated your Residential status with said AMCs, no need to link Aadhaar (as an NRI). nowadays i’m hearing alot that soon all insurances premiums will get increase significantly may be almost double. even old policies will also get impacted. can you plz give more insight on this if this or related newz is true. I am assuming that you are referring to Health insurance policies. Some of the Insurance companies (ex : National) have increased their premium rates drastically. Do note that, the increase however should be as per the ITDA guidelines. It has also been noted that National insurance have made it mandatory for policyholders of some of their old Plans to move to new Plans which are highly priced. I believe that one should not entirely depend on health insurance policy and instead should have his/her own emergency fund for unforeseen medical emergencies. Whether I have to link Aadhar to my Non insurance policies like mediclaim, two wheeler policy etc. policies? Yes, but most of the insurers are yet to provide the linking provision..
For how long we are supposed to wait for such non-life insurance policies? Currently, I am an NRI, however, I had got Aadhaar Card when I was resident in India. Should I update all my accounts with Aadhaar Number or not? As of now, it is not required. You may kindly check with your bank(s) as well.